Isn't it pretty? I love the purple in this cover, and I like the sword! The way the artist uses the reflections is just so awesome! I'm in love with these book covers. One of these days I'm going to give into the temptation of shelling out the money for finished copies! And, here's what it's all about! "Just as Sophie Mercer has come to accept her extraordinary magical powers as a demon, the Prodigium Council strips them away. Now Sophie is defenseless, alone, and at the mercy of her sworn enemies—the Brannicks, a family of warrior women who hunt down the Prodigium. Or at least that’s what Sophie thinks, until she makes a surprising discovery. The Brannicks know an epic war is coming, and they believe Sophie is the only one powerful enough to stop the world from ending. But without her magic, Sophie isn’t as confident. Sophie’s bound for one hell of a ride—can she get her powers back before it’s too late?" I do love how the purple of this cover pops, and the reflection-theme. Unfortunately, March is 8 months away! I don't know how I can wait! I'm so, so excited for this one! Seriously psyched for this! Love the US covers (the UK covers not so hot) and can't wait for this one to be all lined up with Hex Hall and Demonglass! By chance does she get a cat in the second book? 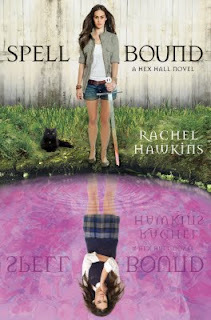 I've only read Hex Hall, and I was confused by the kitty on the cover...and here it shows up again.